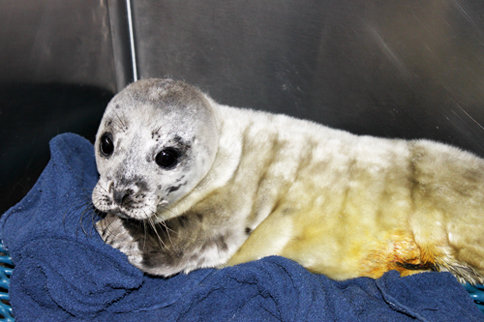 The Center's “Leave Seals Be” campaign urges beachgoers to report sick and injured seal pups to rescuers. Theros, a young harbor seal pup, rests at The Marine Mammal Center in Sausalito, CA. We depend on the public to be our eyes and ears and let us know about young seal pups that may need our help;" explained Shelbi Stoudt, stranding manager at The Marine Mammal Center. The arrival of the pupping season’s first harbor seal patient, nicknamed Theros, is a reminder to Leave Seals Be so they have a second chance at life. Leave Seals Be is The Marine Mammal Center’s public education campaign to remind people along the California coast not to pick up or disturb harbor or elephant seal pups they spot on the beach. Instead, the Center encourages the public to keep their distance when they see what might be a sick or abandoned seal pup, and to call its 24-hour response line at (415) 289-7325 or 289-SEAL. The Center can then monitor the pup to see if the mother returns and if needed, dispatch a trained team to rescue the animal should no mother return. The first two months of a harbor seal’s life are the most critical and set the stage for his ability to survive. Mother will nurse the pup for approximately 28 days providing him with the nutrient-rich milk he’ll need in order to gain enough weight and strength to survive the following month when he begins to learn to forage on his own and mom is no longer around. It’s during this two month period that he runs into many obstacles such as human interference, predators, entanglements in ocean trash, and even stormy weather. Sometimes members of the public mistakenly remove what appears to them to be an abandoned pup, because they believe they are helping the animal. The best way a beachgoer can help a sick, injured or an abandoned seal pup is to call the Center’s response hotline to alert trained rescue volunteers. Once on site, they can assess the situation to see if the pup needs to be rescued. In many cases, the pup may be put under observation on the beach for 24-48 hours to see if the mother will return. This observation period is critical as the mother may be nearby waiting for a chance to reunite with her pup. The Center never removes a pup from its mother during the critical nursing period unless it's apparent the mother is no longer available and the animal is weak and ill. In addition, it is illegal and punishable by law for unauthorized people to pick up, handle or disturb any marine mammal under the Marine Mammal Protection Act of 1972. Only trained, authorized responders, like volunteers and staff at the Center, are allowed to do so. 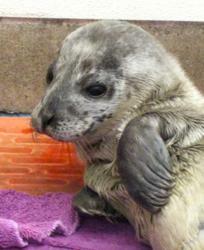 Theros is the first harbor seal pup rescued by The Marine Mammal Center in 2012. Theros still had his silky white lanugo coat or ‘birth coat” as well as his umbilical cord when volunteers rescued him from a beach in San Luis Obispo County on February 20. With no mother in site, for days, the little pinniped was transported to the Center and is currently receiving medical care by a team of veterinarians and volunteers. The hope is to get him healthy and strong enough to be returned to the ocean. Watch Theros play with a "fish-sicle" in his pool. Stay at least 50 feet away from it. The pup’s mother may be nearby. Do not handle it and keep other people and dogs away. Call The Marine Mammal Center’s 24-hour response hotline at (415) 289-7325 or 289-SEAL. In Monterey and Santa Cruz Counties, call locally at (831) 633-6298. In San Luis Obispo County, call locally at (805) 771-8300. To learn more about the Leave Seals Be campaign and how you can help marine mammal pups like Theros, visit http://www.MarineMammalCenter.org. Theros was just days old when this photo was taken at The Marine Mammal Center in Sausalito, Ca Veterinary staff at The Marine Mammal Center in Sausalito, CA tube feed Theros a fish milk shake made from ground herring, salmon oil and water.